Wow. 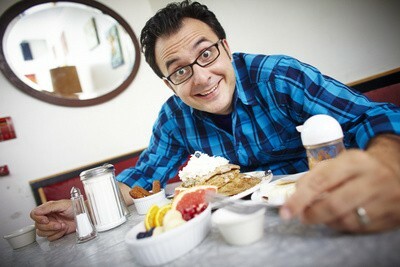 John Catucci really has the worst job ever. Searching Canada for the best there is in comfort food? No thank you. The stress that man must feel being so satisfied at all times. I am not jealous of his life at all. In all seriousness though, The Food Network's You Gotta Eat Here (which Catucci hosts) is on a quest for Canada's best belly warmers, sampling from diners, greasy spoons and tasty little neighbourhood restaurants like Tess. The show filmed an episode at the Charles Street sweet spot in August, and Catucci dug into quiche, a scallop and shrimp dish, and the waffle dish from heaven, Croque Madame (ham, swiss and gruyere cheese and a fried egg ON a waffle). Tonight's the night that episode airs, at 7:30pm and 10:30pm (on the Food Network). See for yourself what the show thought about the north end resto, and promptly start feeling sorry for Catucci, and his hard, hard life.